Youthful skin is something every girl desires, no matter what stage in life you’re in. 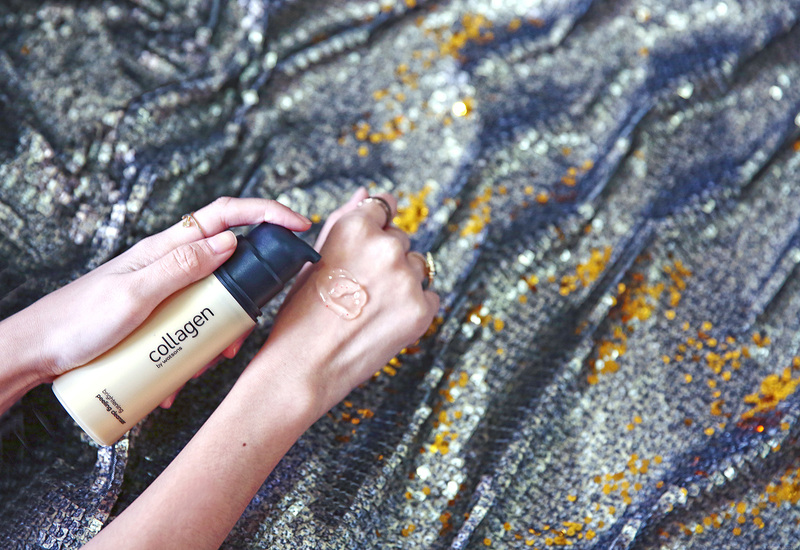 This is why so many skincare products out in the market make use of collagen–an ingredient proven to be a fundamental part of achieving just that. It helps in improving skin’s elasticity and fighting skin ageing, making one’s skin more supple, firm and moisturized. 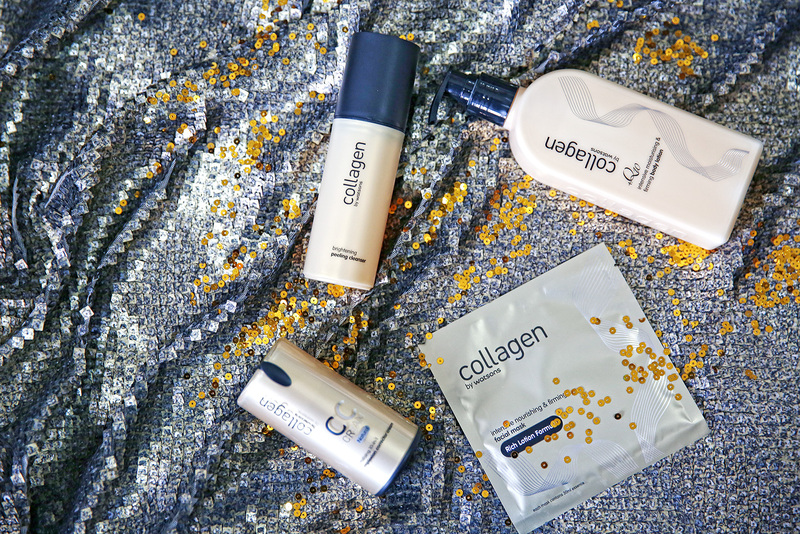 Now,imagine an entire skincare line developed not just with one type of collagen, but three. Collagen by Watsons Moisturizing Skincare Range offers an upgraded tri-collagen complex from Europe, namely collagen peptide, hydrolysed collagen, and atelocollagen. Collagen Peptide increases suppleness of the skin; Hydrolysed Collagen regenerates skin; and Atelocollagen minimizes wrinkles and fine lines. I was fortunate enough to try a few of the products from the skin care range, all of which I’ve reviewed below. Let’s start off with the Brightening Peeling Cleanser. It contains mangosteen peel extract and jojoba beads that help to gently and effectively soften and remove dead skin cells and impurities. To use, keep your hands and face dry. Apply a liberal amount and gently massage on your face with your fingertips. Wash off with lukewarm water. Because this isn’t your ordinary cleanser, it’s recommended to be used only 1-2 times per week for best results. I actually like this product the most. I like feeling the little beads on my face as I massage the cleanser on to it. It feels so relaxing and I can really feel all the dirt and dead skin cells coming off, leaving my skin softer, smoother, and more radiant. I thought it would be nice to follow up the Brighten Peeling Cleanser with the Intensive Nourishing and Firming Facial Mask. 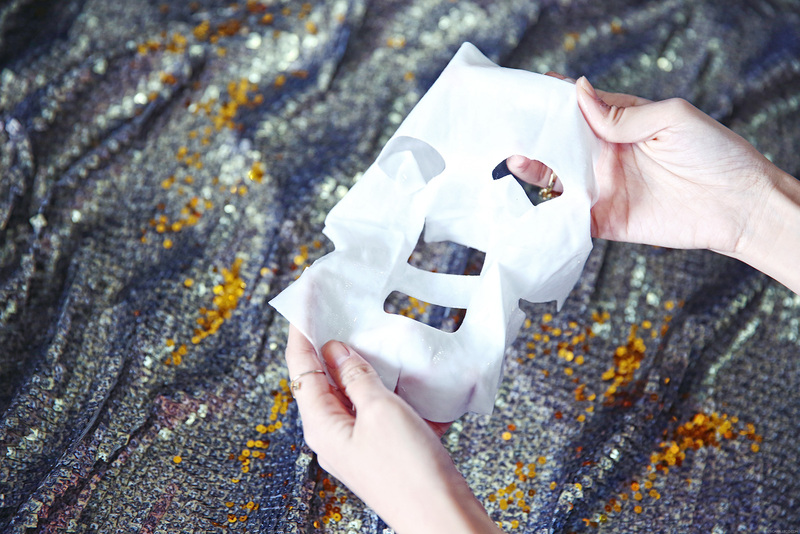 This way, my skin can easily absorb all the mask’s nutrients because my face is now squeaky clean. According to the instructions, all I had to do was put the mask over my face for 15 minutes and massage the remaining essence onto my skin after taking the mask off. The mask certainly felt packed with nutrients. Each piece is said to have 30ml of rich essence that contains skin-friendly, hydrating and soothing Allantoin to deeply nourish, tighten and soothe skin. I used the mask at night because I wanted to see if the effects are still there when I wake up. So far, so good! I woke up with a subtle glow on my skin and it still felt super tight. With all the rage over CC creams, it’s no surprise Collagen by Watsons Moisturizing Skincare Range also has one. Its Revitalizing 10-in-1 Complexion Corrector Cream claims to conceal imperfections, perfect skin tone, moisturize and nourish skin, minimize and refine pores, brighten skin, reduce fine lines, repair skin, provide long lasting freshness and protect skin from premature ageing caused by the harmful environment. Whew! 10-in-1, indeed! 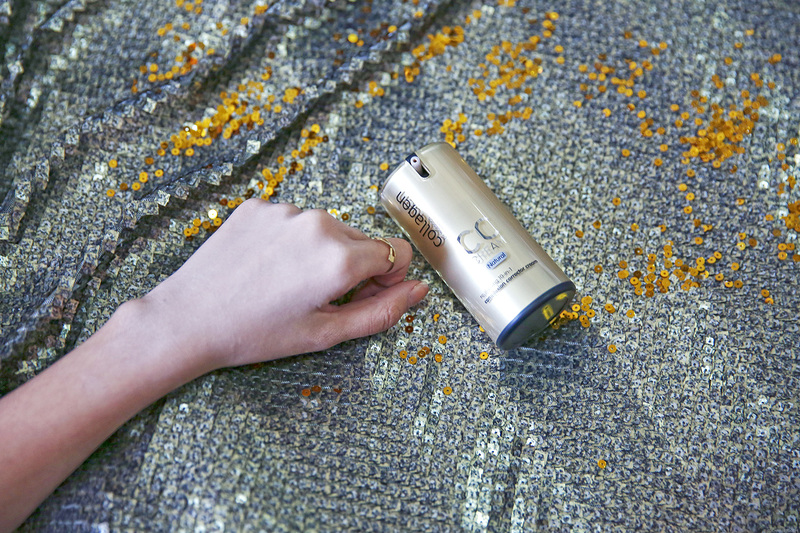 Infused with a mineral-rich Caviar Extract to reduce the appearance of fine lines and help improve skin elasticity, this CC Cream makes skin youthful and luminous. All you have to do is apply an adequate amount on your cheeks, forehead, nose and jaw. Spread over your face from inside out until you reach your neck. Don’t spread it in a circular motion though, it’s recommended to just pat the product onto your face until it’s fully absorbed. 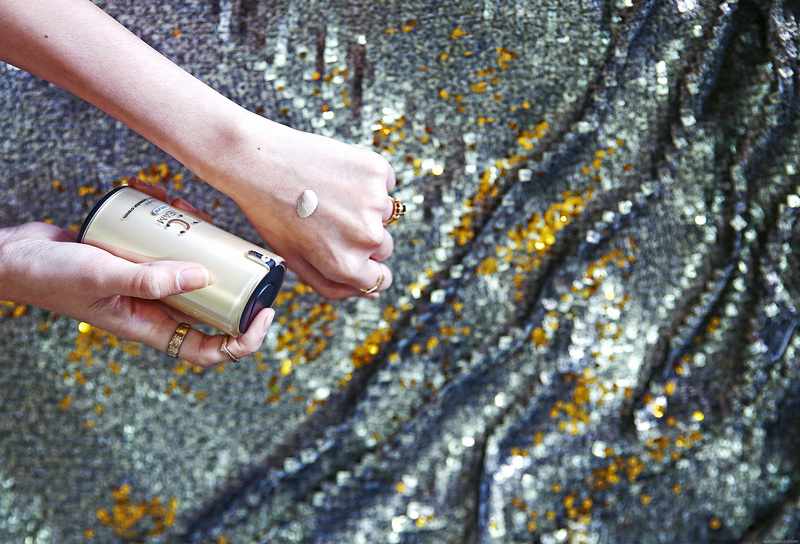 I applied the product on my wrist so that you can see how it registers on my skin and how much coverage it provides. It’s very light so like any other CC Cream, it doesn’t provide a lot of coverage, although it does cover the veins on my hand and improves my skin’s complexion. It does look a bit lighter than my actual skin color though but it improves after it sits on my skin for a while. Collagen by Watsons Moisturizing Skincare Range doesn’t only have products for the face but for the body as well. One of which is the last product on this review. It’s called the Q10 Intensive Moisturising and Firming Body Lotion. Now, don’t let its name scare you. It actually feels lighter than it sounds. This lightweight, non-greasy, and easily absorbable lotion contains anti-ageing Q10 and nourishing Soy Bean Oil to help moisturise and soothe discomfort caused by dryness. I’m not really too particular with the body lotions I use so long as my skin feels smooth afterwards. This one does the job well. It smells good too! Collagen by Watsons Moisturizing Skincare Range is exclusively available in all Watsons stores and The SM Store Beauty Section branches. Oh no, I no longer remember! So sorry! After using collagen CC cream can i use BB cream or other foundation on my face ??? Do you think it will not iretated?? I am not sure if its really dirt that’s being removed by the Brighten Peeling Cleanser… do you still use this product? Is it really effective after using it for a long time… I’m actually hesitating to buy this because of the review i’ve watched in youtube… need your advise please… thanks in advance. hi miss camille. have you tried their night cream? Hi Ms. Camille, finally got the courage to try the collagen peeling milk after reading your blog about collagen products by Watsons. It’s my first time to try this kind of product… And I love it! As I gently massage it all over my face, I see the dirt and dead skin coming off. It makes my face feel softer ☺️.ang galing …So far ito palang na-try ko.. Pag may budget na ung iba naman din hehe..
Is the peeling toner something like astringent? Thanks Miss! Does it contain parabens? Is it safe to be used by pregnant women? I’m not too sure for use of pregnant women. hi camille,what product can u recommend to removed or lightened the scars? Hi Camille! What can you recommend for sensitive, dry and oily skin? Meron bang 1 product that can address all of these? Yun kasi hanap ko. Hope you could help me. Thanks! Hi, Ms. cammile, what product you can recommend for the acne marks? Thanks in advance. Would you recommend this to sensitive skin? Hi Camille! I’m just curious and eyeing Collagen CC cream… Is this oily or sticky in the face? I tried to check this on one of Watson’s store and I wasn’t able to see it..Where did you buy this things? How much yung lotion and facial mask? I want to try..
Hi there Camille! I was wondering what’s the price of the CC cream and the brightening peeling cleanser? Thanks. Would you please continue using these products so you can do another blog about your judgment on these products whether they are worth purchasing as a substitute for high end skincare products or not, for those with tight budget like me? Thank you for the consideration. Will you use them if you are also on a tight budget? Thank you for your thorough review, Camille! I actually really try and finish the products that I’m tasked to review. But whenever I don’t have any reviews scheduled, I go back to my usual. Facial cleanser that really works for me is Proactiv. It’s for acne prone skin, although I don’t have acne, I like using it because I feel like it really cleans my face. For moisturizers, I try a lot of different ones really. Right now, I’m using Lancome. With all the beauty products you had tried and blogged, what are the products, you will swear by it’s effectiveness, that you religiously use from day to night? I’ve tried a lot! And still trying haha! Hmm what products specifically? Facial wash? Moisturizer?